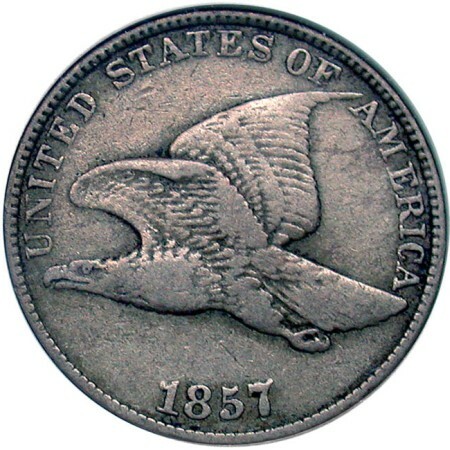 The flying eagle penny was produced from 1857-1858. It was the first small sized penny or one cent us coin. It gets its name from the eagle on the obverse (front) of the coin. On the reverse the words ONE CENT are surrounded by a wreath. This term when used in coin collecting describes a prototype of a proposed coin design. pieces to show senators and congressmen what they would look like. These coins were supposed to have been destroyed, however, for unknown reasons some of them were not. The coins that managed to slip by and avoid destruction are very valuable as they are extremely rare. A variation in the design of a particular coin. Some dates have several die varieties. 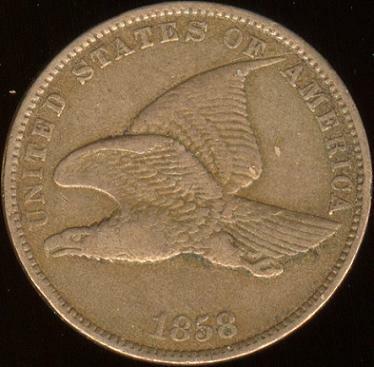 of flying eagle cents made in 1858, a "small letter" variety and a "large letter" variety. You can tell the difference in the two by looking at the word America in "United States of America". In the "large letter" variety, the letters A and M are joined. In the "small letter" variety, they are not joined, as seen in the photos below. 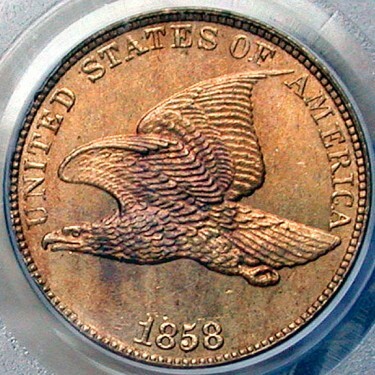 These photos show the two varieties of the 1858 Flying Eagle Penny. Click the images to see a larger view of the coin. The Flying Eagle Cent was made of 88% copper and 12% nickel which earned them the nickname "Nicks" or nickels. They were also known as the white cent since previous pennies were made of solid copper and were much darker. This refers to the process by which a coin is minted. It could also refer to the sharpness of design details. For example, a sharp or strong strike will show all of the details struck very sharply, but a weak strike will show details lightly on those points. This is a slang term used to indicate the rarest date and mint mark of a particular coin series.. They can also be collected with a modest budget, although some if the more rare coins are very valuable. Also see Coin Values Discovery for grading images and value charts for your Flying Eagle Cent.